It’s a burning question I often get not only from my readers, but from all of my friends as well: “How can I stop craving junk food?” Believe me, you can – while still indulging in some temptations! I always compare junk food with smoking – it’s addicting! I personally never had a serious problem with junk food, but from time to time I fall into the traps of Nutella and cake frosting, a lot less now than before. I believe that mistake many people make while trying to quit junk food is quitting cold turkey. If you go from eating fast foods all your life to eating salads and tuna sandwiches most likely you’re not going to make it longer than a week, a month if you have a will power of steel. I also it’s good anyone to just change their eating habits overnight. I would like to share some of the tips I collected over the years that help me every time I realize that I am getting carried away with junk food. Don’t tell yourself, “I need to stop eating junk food” or “I need to diet”. Instead, say I need to add more healthy foods daily into my eating regimen. This definitely shifts your perspective a lot, because mindset is very important. Then once you have set the correct mindset, don’t cut the junk food right away, instead just add something healthy every time you eat. Such as a cup of broccoli, kale, carrots, apple etc. This is a really good trick because the more we add certain foods to our diet, the more our body begins to crave that food on a regular basis. 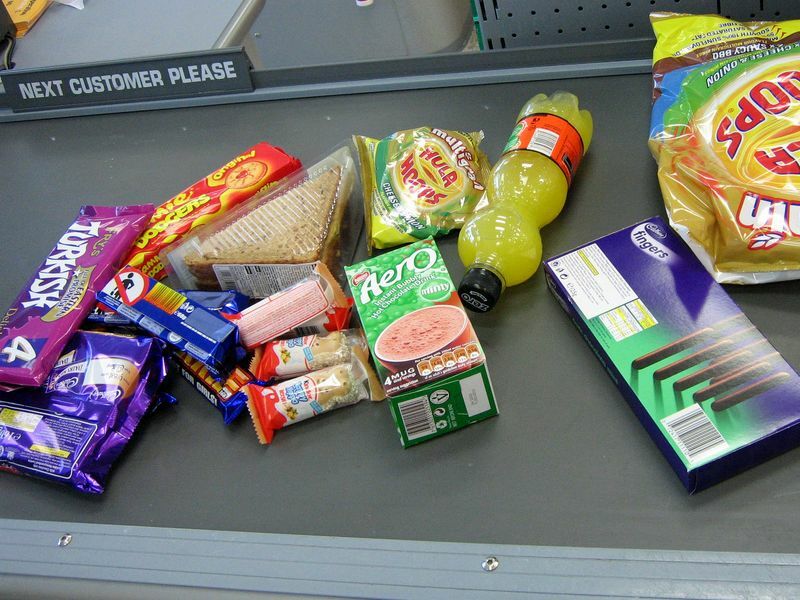 Does this look like the contents of your shopping bag? That’s how I began to love broccoli: before I just couldn’t stand it, just a thought of broccoli made me ill. But by adding a cup of broccoli every day to one meal, I started to develop a taste for it, then all of a sudden I loved broccoli. I did the same thing with other vegetables I hated such as carrots, and the result was exactly the same. Now, I love carrots! Whatever we eat on a regular basis, that’s what we begin to crave. I think that’s where the saying ” You are what you eat ” came from. Give it a try! Instead of getting the usual rising crust with dripping cheese, buy the one with whole grains and mozzarella cheese, trust me it’s just as delicious and it’s a lot more healthier. Instead of eating regular french fries substitute it with sweet potatoes fries and bake it instead of frying it. If you bake sweet potato fries you are not using any of the oil that is usually added when it’s fried. Instead of getting regular potato chips, get sweet potato chips or vegetable chips. It is still not a healthiest food but it’s definitely a better option. You can do even better, by making your own chips from kale at home. Make your own lemonade, I know it’s not soda, but it’s many times better choice. All you need is water, lemons and raw honey, It’s sweet, delicious and nutritious. I’ve learned to my make my own with whole ingredients. I mix raw honey, raw ground hazel nuts and raw coco powder. Because it’s more expensive to make it your self, I naturally eat less of it ;). 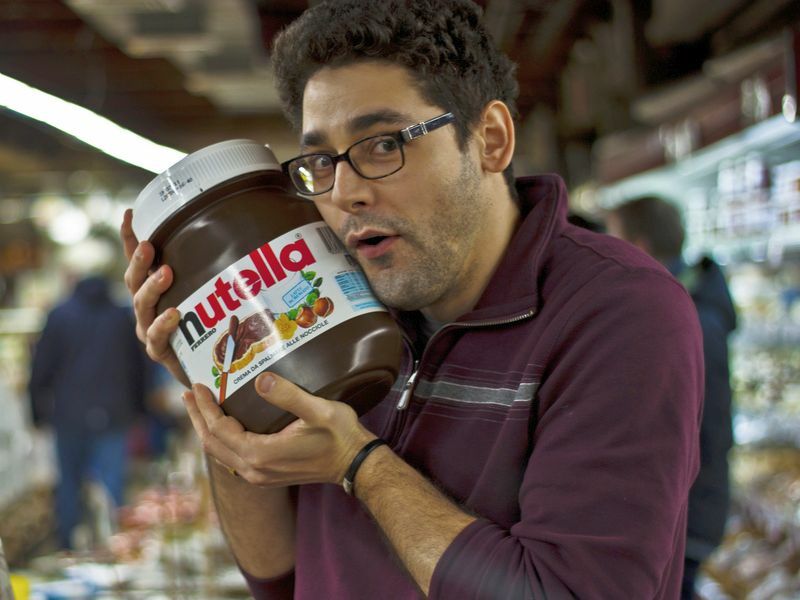 Nutella: who can say no? You can do that with all the foods you love, just get the healthier food and then it won’t feel like you are on a diet. As you can see it’s more of slowly getting your self adjusted to the right way of eating. I try to eat every 2-3 hours. I noticed when I do that, I never get cravings for sugar or junk food of any kind. But as soon as I let my self feel hunger, even if it’s just a little, I can tell my mind starts wondering into the sugar section and I begin to daydream of cake frosting again. But eating small meals more often keeps me satisfied. I completely avoid keeping junk food in my house. If I don’t see it, I don’t think about it. I also found this way as one of the best ways to exercise my will power. I came to realize that it’s also not healthy to always eat perfect – and learned that the hard way. The longest time I went without eating any junk food was a year and a half. I followed all of my own principles except for one, for that full year and a half I didn’t have a cheat meal. And then it began, all of a sudden all I wanted was candy, cake, nutella, potato chips and shelled peanuts. As much as I tried to fight it, at the end I am only human so I gave in and allowed my self to eat what I craved. But I am sure if I would of had a cheat meal at least once a week, I would’t of gotten those carvings so out of control. It’s all about a healthy balance. The more we practice good eating habits the easier it gets to say no to junk food. Pictures courtesy of Juliana Dacoregio, Laura Burns and Jack Zalium. No kidding about simply not having it at home: I have an incredible weakness for cashew nuts: They aren’t exactly junk food, but when a tiny bag you can eat in one sitting carries 600 kcal, the effect is pretty much the same. When I buy them now it’s only a single bag, as whenever there were more, they despite my best intentions didn’t survive for very long. OMG I love cashews! I can eat bags and bags of cashews, those are the toughest to resist. I’ve been good this week, I have not bought any nuts – but I am totally thinking about cashews not – your fault Evil C :). I also agree it is best to keep junk food out of sight. Its good to indulge once in a while but if its always there in front of you, its too tempting to “cheat”. Hey Ralph, it’s nice to see you :). You’re being friendly today, did you get a cold – just kidding :). Yes, junk food for me if it’s out of sight it’s out of mind. Nice! Then you hope you don’t run out of it, or we’re all in trouble :). “Eat Less More Often” This saved me!!! The worst for me is ice cream and disturbingly pancake batter (raw). Luckily ice cream can be substituted for greek yogurt with frozen berries, any fruit in fact, cocoa powder, honey, vanilla, nuts, etc. Cheesecake and donuts are also terrible for me. Reduced fat cream cheese, cottage cheese, and a whole grain cereal with desired flavors, haven’t found one for donuts yet. Although, I still allow the real thing in moderation, at least in a perfect world. Luckily most things I like are things I can commonly eat in my program, such as kashi, cottage cheese, all natty nut and peanut butters, eggs, cheese, butter, meats, most dairy, onions, potatoes, beans, rice, etc (I have a pretty liberal fat to carb ratio). Also, I find macronutrient ratios play apart in cravings, low fat and low carb diets are both just terrible. Enough food volume is also a factor, doing the cardio, being out of the house on a walk. Keep busy, never say never, in moderation, god save the queen, god bless america. Sugar and white bread are my trouble… I am in a constant battle with them. Personally, not seeing junk food helps me the most, so I almost never buy bagels and candy. Yes it’s good not to buy it completely, I do the same thing, cause if you don’t see it you don’t want it as much. I’d love the exact recipe of your home made nutella pls!